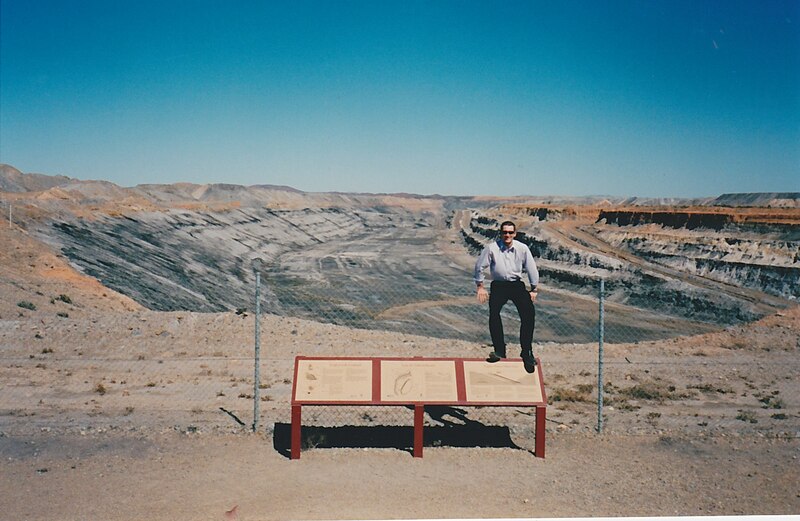 Today I visited the Beverley uranium mine in northern South Australia, operated by Heathgate Resources. Heathgate have been a client of mine through ThinkClimate Consulting for the last two years for the delivery of mandatory greenhouse gas reporting under NGER. 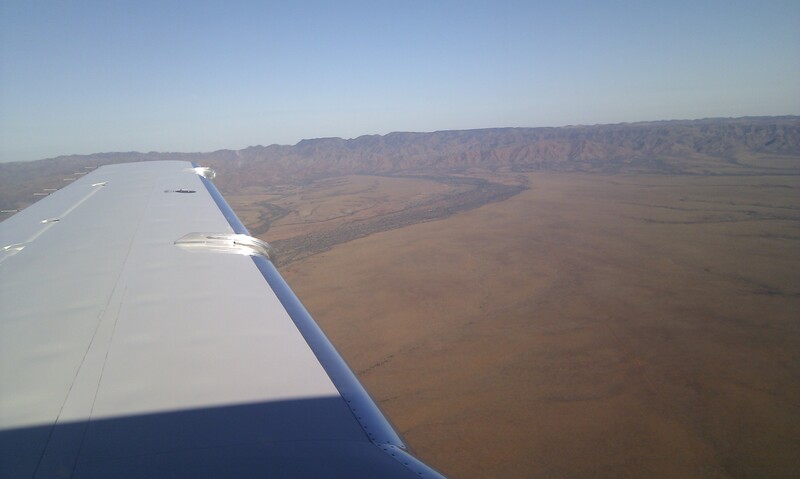 It was clear skies on the flight in, showing an amazing landscape at the foot of the Gammon Ranges on the border of the Arkaroola pastoral lease. From the air the low vegetation takes on a wonderful patterned effect. It is a stunning view, with visible water courses snaking across the land. It is easy from that height to envisage that it was once covered in ocean. In both the landscape of eroded mountains and the creatures that inhabit it, tell-tale signs of truly ancient history abound. As you approach the site in from the air, the various locations that make up the Beverley operation begin to appear. Each is truly unremarkable in size, no bigger than a block you might find in an industrial suburb of Adelaide. Even taken together it is a small imprint on the land. From ground level you could be forgiven for thinking the landscape of the plains is a “barren desert”. Nothing could be further from the truth. 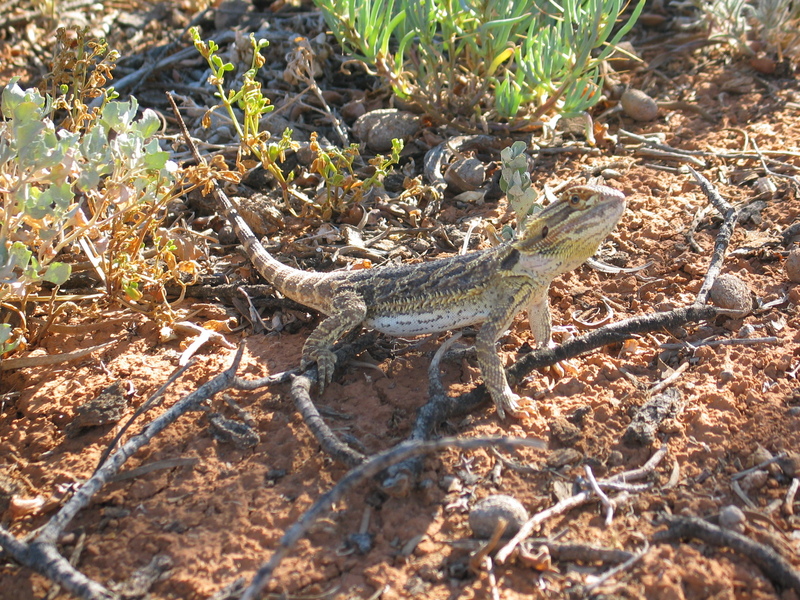 On a simple site visit I saw wedge tailed eagles, nesting and flying, a beautiful small lizard whose name escapes me and a truly wonderful example of a bearded dragon basking on the road. This critter was too bold for his own good and was impervious to our best efforts to shoo him away. He simply was not afraid. A true highlight of the day was the head of Health, Safety and Environment picking this feisty fella up on a shovel and carrying him into the scrub, hopefully to safety. The regular wildlife surveys reveal a multitude of birds, insects and reptiles, from tiny banded snakes to big lace monitors and woma pythons. After enough rain, the local water course, previously dry as a bone, abounds in a fish called the Spangled Grunter. As a word-lover, I am so, so glad to know of the existence of something called a Spangled Grunter. But I was not there to check out the local fauna. I was lucky enough to see most of the facilities and processes and see how this form of mining works up close. My registration as a day visitor included notification that this was an area of naturally elevated radiation. I queried the radiation protection officer on this. Working here for a year, exposure of about 2mSv could be expected. You would receive a larger dose of radiation taking a flight to London than visiting the mine for a day, but I have never been warned ahead of boarding the aircraft. Oh well, such is insanity. Following registration at the main camp (which, by the by, is every bit as pleasant, both in the view and the facilities, as many tourist locations) I was fortunate to have a good tour of the processing facility with the radiation protection officer. Having visited many industrial sites in my time, including a few mines, one of the strongest impressions of Beverley is that it is neat, tidy, and remarkably quiet. It struck me as particularly safe for such an operation. The liquid ore for the main plant arrives for processing in pipes from the main deposit, with some trucked in from the satellite locations. The trucks in question are not your frighteningly oversized Caterpillars, but rather modest and road-legal tankers. So there is minimal heavy vehicle movement, and the materials and ore are essentially never exposed until the dried uranium oxide (yellow cake) is loaded into drums (an automated process, within a sealed room) at the far end of the process. We visited one of the satellite well fields where the in-situ leaching process takes place. As I have previously described, it very much resembles a big above ground plumbing apparatus with two large trunk lines, one marked “IN” the other marked “OUT”, that then diverged into perhaps a couple of dozen injection and extraction wells. Here, a solution of hydrochloric acid was being injected below the surface to dissolve the ore. The well fields are pretty small, and the disturbance is minimal. The area has been cleared to permit the mining. When the ore has been extracted, rehabilitation consists of cutting off the well heads to a depth of 2m below grade, backfilling the wells with concrete, covering the wells, and then furrowing the area to facilitate re-colonisation by the local vegetation (to provide a simple description of the process). Truly, this is very low impact mining. There is a good discussion of the overall process in this transcript from Catalyst (NB this reference is 5 years old. Some of the processes are slightly different to those I saw). This fluid that has been injected is then extracted with a solution including dissolved uranium. The uranium is stripped out of the fluid by bonding with a resin. The resin is then stripped away and reused, and the solution is dried and packed into drums as yellowcake. For export of course. We don’t use it here. Heaven forbid. That would be… fill in the blank folks. What would that be? I can’t come up with much except “exceedingly sensible”. Others seem to come up with things like “ecological catastrophe”. How can such divergent views of the same processes and products exist particularly among people who all claim a care for ecology and our natural environment? In my fairly brief time as an advocate of nuclear power, I have heard some criticism of the type of process and operation that is delivered at Beverley. The first is that polluted waste solution is re-injected into an aquifer. That’s 100% correct, it is. Some context is required though. Prior to use for this mining purpose, the contents of the aquifer in question are no of use for other common purposes like, for example, agriculture. It is salty and, self evidently, radioactive. The solution that is reinjected is, quite obviously, less radioactive than when it came out. From the point of view of Heathgate, the less radioactive the better; it means they are capturing more product, and making more money. The radioactive material that is re-injected is more mobile than it was before (for a period of some years or perhaps decades), but there will be less of it, and on the basis of the geological surveys, the aquifers are isolated, as I discuss further below. The second main criticism I have heard is that operations like this run the risk of polluting the Great Artesian Basin. You would expect the folks at Heathgate to take care of this. Why? They run on-site desalination from the Basin to supply their potable water. Pollution of this water source is most certainly not in their interest. More to the point though, it would be virtually impossible, for two reasons. Between the aquifers that are being mined and the GAB is a very large, impermeable layer of clay. Accessing the Basin by accident is nigh on inconceivable. If one did though, the pressure from the basin would be such that the chances of actually getting anything in there are practically nil. That is what the word Artesian in Great Artesian Basin means: a water body under positive pressure. Overall, the process of ISL mining of uranium has considerably less environmental impact than other conventional mining techniques. Both sites, which are remote from urban areas and occur in semi-arid pastoral country, have relatively small surface footprints, are environmentally conscious and have initiated some world’s best practice techniques. Both sites are considered to be compliant with the many Acts, Codes of Practice and Regulations. The use of acid rather than alkaline leaching and disposal of liquid wastes by re-injection into the aquifer is contentious. Available data indicate that both the leach solution and liquid waste have greater concentrations of soluble ions than does the pre-mining groundwater. 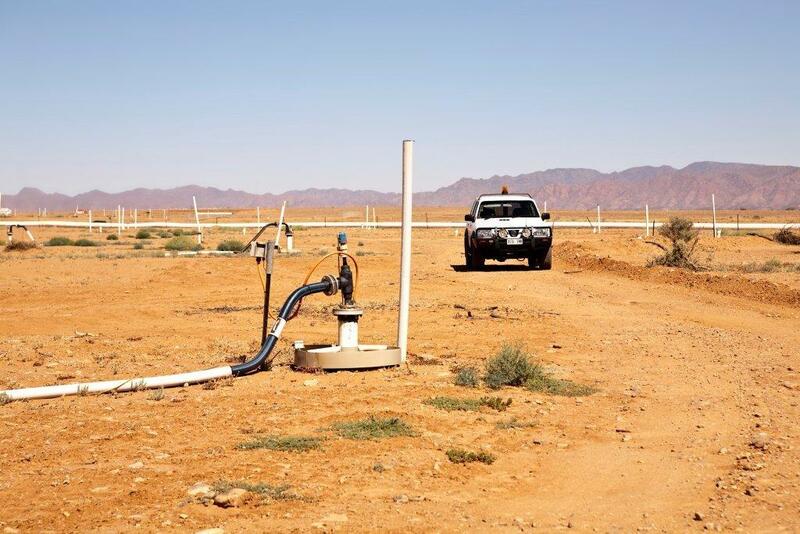 However as this groundwater has no apparent beneficial use other than by the mining industry, this method of disposal is preferable to surface disposal. Although not yet proven, it is widely believed and accepted that natural attenuation will result in the contaminated water chemistry returning to premining conditions within a timeframe of over several years to decades. These very simple and straightforward realities beg the question for me of how people can get so excited about this place and this type of mining. The fact is, whether it is food, energy, water or any of the other goods and services humans enjoy, essential or non-essential, we never, ever get something for nothing. We will, and must, make an impact. The challenge of attaining sustainability in a world that is heading for 10 billion people is to minimise our negative impacts both in quantity and dispersion and, where possible, be smart in our actions to enhance and increase positive impacts. Deciding whether a process or product is “good” or “bad”, “desirable” or “undesirable” is therefore an entirely relative concept. It is quite devoid of meaning unless the action under judgement is being considered for impacts in many areas of sustainability, and alongside the alternatives. In a nut shell, the operation at Beverley clears very discreet patches of land, takes otherwise unusable aquifers, acidifies some of the liquid in the formations, extracts it, takes the uranium, and returns the waste to the aquifer, where it stays. In return, we get the raw material to enrich and then fabricate fuel for the generation of a staggering quantity of energy. We get that energy with no greenhouse gas, particulate pollution, or other nasty airborne pollution. From an sustainability perspective, it is not perfect. It is merely excellent. Contextualising the negative impacts of the mining is only possible when you appreciate the scale of the energy being exported. In the packing plant, a shipping container awaited with about 60 drums of yellow cake, each weighing around 290kg. That’s 17.4 tons of U3O8 awaiting export. This will go on to provide around 8.7 million GJ of zero carbon energy in typical modern light water reactor. For comparison, my flight home took me via Pt Augusta, where I enjoyed a view from the air of the Northern and Playford coal fired power stations. To generate the equivalent energy contained in the shipping container of U3O8 from these stations would demand the digging and transportation over 13,000 laden railway cars. As the depleted uranium from the enrichment process and the waste products from the power generation plants find their way to Integral Fast Reactors, about another 250 times the energy will then be available, at no additional mining impact. This world of ours is full of complex decisions that need to balance competing needs to attain something called sustainability. The last thing we should be doing is making the easy ones harder than they should be. This is an easy one. 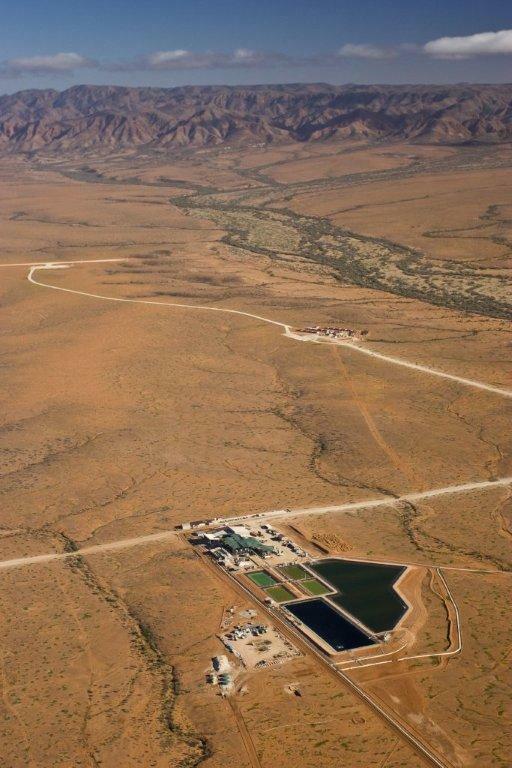 If you want a good outcome for global sustainability, in-situ leach uranium mining for nuclear fuel is a hell of a good deal. Australia should do more if it. If you just want amazing views and some close encounters with bearded dragons, try and get a seat on the flight to Beverley. Many thanks to Sue and Martin, my hosts and guides for the day. I keep coming back to the theory that the only people who can rationally NOT like nuclear energy are the people who make their money by selling the inferior forms. It is always rational (though not necessarily moral) to fear such overwhelmingly capable competition. What is irrational is when people who think they are working for the environment act in opposition to nuclear energy development. They are unwittingly carrying the water for the coal, natural gas and oil business. “They are unwittingly carrying the water for the coal, natural gas and oil business.” I try to stress this point. It gets through, sometimes any way. Seeing Beverley and also Northern and Playford Power stations in the same day really drove home the idiocy of our anti-nuclear energy decision-making. It’s quite extraordinary how much uranium there is in SA. I understand the Petratherm geothermal experiment to the east drills into the same granite which creates the alluvial outwash for ISL. One of the ISL operators was talking about making uranium fluoride onsite rather than yellowcake, ready for enrichment. With Leigh Creek coal field and Cooper Basin gas field in their twilight years SA will have to find a new source of baseload power. If only the politicians could think of something. From what I can tell, they are not even trying (some notable exceptions). It’s going to take people to make it worth their while, I’m afraid. From the perspective of a geologist, it is very hard to conceive of a problem to groundwater from this extraction process. The Great Artesian Basin exists because of the extensive impervious layers overlying the aquifers, so would be impossible for contaminated water to get in. Secondly, the roll front uranium deposits form because water is confined to a particular aquifer, so water cannot get out. It is certainly better to put it back into the ground than to have surface ponds attracting and killing water birds, as happens at Olympic Dam. “From the perspective of a geologist, it is very hard to conceive of a problem to groundwater from this extraction process.” From the perspective of an anti-nuclear activist, it seems to be a piece of cake. I had some of these discussions on my visit to Perth this year. The gulf between best scientific knowledge and the anti-nuclear rhetoric is really, really big for ISL. Ben – thanks for the brilliant post. I hope you’re going to cross-post this on Brave New Climate; IMO a real, on the ground look at in-situ leaching would be very interesting on BNC. Cheers Andrew, much appreciated. Hope you will pass on the link. Barry reads all my stuff and knows he is welcome to the content for BNC , so we’ll see. Thanks again. I put this to Barry and you can now see the post on BNC! Thanks for the suggestion Andrew! You’re most welcome and I’m delighted to see the post there. Funny thing is we’ve got at least twice as much thorium. So Governments should press ahead with the R and D for things like the LFTR. Thanks for providing the reference John. With the woes of the manufacturing industry in SA I wonder what the pundits see as the way ahead. I gather Canberra is helping out with $200m to keep the car assembly lines going and OneSteel is to get an early $65m advance on their carbon compo. Perhaps SA will build more submarines and hope the next lot are reliable. However military contracts don’t employ the same number of people. Factor in looming gas and coal shortages and the inevitable return of river water problems. Before long both money and physical inputs will dry up and SA will have to think of something else. The obvious alternative is for SA is to go large on the nuclear fuel cycle. Expand ISL and hard rock mining of uranium, construct 3rd generation nuclear power plants and enrich uranium to fuel them. Export electricity to the eastern seabord in summer instead of importing it particularly as gas gets expensive. These new industries could employ thousands of people directly and indirectly. Cheap low carbon power should keep existing jobs in SA. Any Federal assistance should be a one-off, not recurring as we see now. Alas I fear nothing will change until the catch-up costs are enormous.